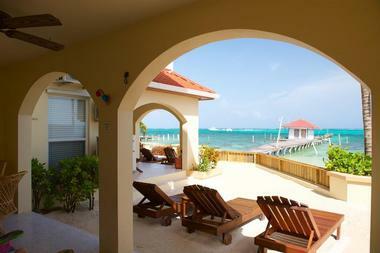 Located off the coast of Belize, Ambergris Caye is an idyllic tropical island destination in the heart of the Caribbean. Offering warm tropical waters and an abundance of marine life, the island is a sought-after snorkel and scuba-diving destination that attracts many marine enthusiasts who come to experience the riches of the world-famous Great Blue Hole and Belize Barrier Reef. The island is also a romantic retreat perfect for honeymooners, and many of the resorts offer couples the chance to tie the knot barefoot on the beach. 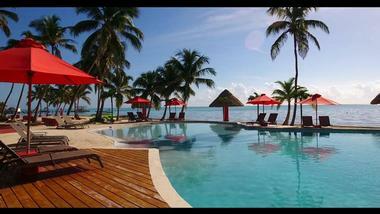 Families will also love Ambergris Caye – a wide variety of water sports are available to keep all ages happy. On the Belize mainland you can enjoy other adventures such as visiting ancient Mayan ruins, zip-lining, and cave tubing. The Phoenix Resort in San Pedro is a great choice for discerning visitors, offering luxury ocean-view suites and all the amenities of a hotel. Although each of the beautifully appointed suites has a fully equipped kitchen, you have the flexibility to have all your meals at one of the many San Pedro restaurants located within easy walking distance. 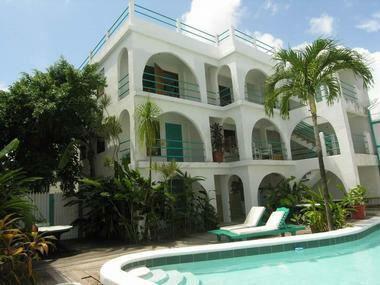 Each of the suites has a private balcony with great sea views, and the pool directly overlooks the Caribbean Sea. After a busy day of scuba diving, snorkeling, or other Belizean adventures you can relax and be pampered at the on-site Sol Spa before enjoying cocktails and dinner at the Red Ginger Restaurant. The Mayan Princess Hotel is an ideal option for couples or families who want to spend their Belize vacation enjoying a wide variety of water activities. 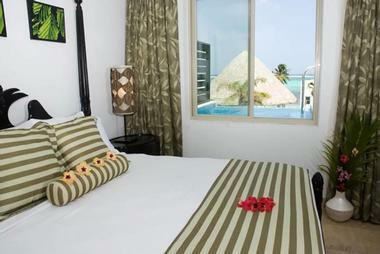 Your beautifully furnished suite is located just steps from the beach and all suites have balconies and sea views. 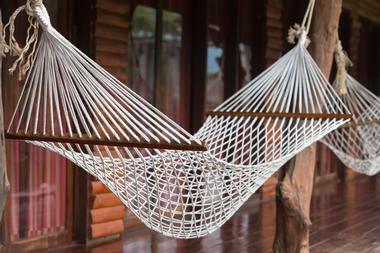 Each room has air conditioning, a well-equipped kitchenette (including coffee machine, stove top, and microwave) and you can even request a hammock for your balcony. On-site water sports include kayaking, paddleboarding, and jet-skiing. The resort also offers full and half-day fishing trips and scuba and snorkeling excursions. The tour desk will be happy to arrange your mainland tours to the Mayan ruins and jungle excursions. Overlooking the azure waters of the Caribbean, the Banana Beach Resort offers a variety of accommodation choices to suit couples and families. Options range from budget-friendly courtyard view double rooms to spacious ocean-view four bedroom/four bathroom self-catering suites suitable for families or groups of friends. The resort has a restaurant offering breakfast, lunch, and dinner as well as a large selection of cocktails and wines, and the on-site Monkey Business Travel Shop will be happy to arrange all your activities, including visits to Mayan ruins, diving and snorkeling expeditions, and many other fun activities. Water-sport equipment hire is available onsite, and there are two fresh-water pools in addition to a private beach. 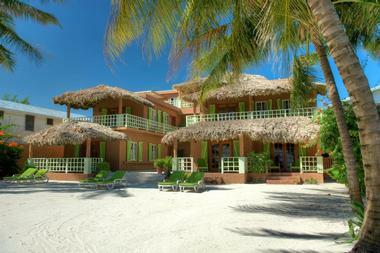 Offering everything you need for a perfect Belizean vacation, the Banyan Bay Suites are ideal for families or couples. You can enjoy the luxury of a home-from-home experience in one of their one, two, or three-bedroom suites, all of which feature a lounge area and either a full kitchen or kitchenette suitable for self-catering. You can spend your days relaxing around the pool or on the beach or get more active and try some of the many activities on offer at the Water Sports Center and the Dive Shop. The resort offers free airport transfers, and there is an onsite restaurant and bar where you can sip cocktails as you watch a brilliant Caribbean sunset. Located right on the edge of the ocean, the Blue Tang Inn offers vacationers a choice of comfortable suites featuring fully equipped kitchens for a relaxed self-catering holiday. You can spend your days relaxing on a lounger on the beach or go all-out to experience all the on-site water sports such as sailing, para-sailing, or kayaking. The resort also offers snorkeling and scuba-diving excursions to some of the island’s best dive sites, as well as sailing and reef-fishing expeditions. There is an on-site freshwater pool as well as a palm-fringed garden, and the inn is close to all the shops and facilities of San Pedro Town. Enjoying an enviable location on a private 1,100ft stretch of white coral sand north of San Pedro Town, Captain Morgan’s Retreat offers visitors the chance to experience a true Caribbean Island vacation. Accommodation at Captain Morgan’s comes in a variety of delightful thatched beach cabanas for two or spacious and elegant beach condos and villas, some of which can accommodate up to eight people. Most of the larger units have full kitchens, making them ideal for a laid-back family beach vacation. The resort also has three fresh-water pools, a restaurant serving Caribbean specialties, a grocery store, bicycle and golf cart rentals, and a spa where you can treat yourself to a relaxing massage. Located just ten minutes from the hustle and bustle of San Pedro Town, the Caribbean Villas and Hotel are surrounded by 3.7 acres of lush tropical gardens. You can choose between a standard hotel bedroom for two or opt to spread out a bit in one of the one or two-bedroom villas with full kitchens. The resort boasts two freshwater pools, a 300-ft private dock, and an artificial reef swimming area and water park perfect for the kids. You can self-cater or choose to have all your meals at the on-site restaurant, which is famous for its Sunday Beach Barbeque and Mayan Pig Roast. 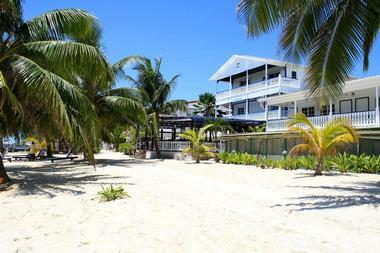 Swaying palm trees and bright lime-green shutters welcome you to Caye Casa, a delightful boutique hotel situated right on the beach and within walking distance of San Pedro Town. Depending on the size of your group you can choose from single hotel-style rooms with king-size beds and wonderful sea views, larger casitas with their own kitchenette, or a spacious one or two-bedroom villa with full gourmet kitchen. You will be able to step straight out onto the beach where you can soak up the Caribbean sun. Paddle-board and kayak rentals are available, and the resort can take you on scuba and snorkeling excursions to the magnificent Belize Barrier Reef. The luxury 4-star Coco Beach Resort is located just 3.5 miles north of San Pedro Town and is proud to offer visitors comfortable accommodation and a genuine Caribbean island vacation experience. Accommodation options vary from the elegant and luxurious two-bedroom penthouses and villas (all of which include a fully-equipped kitchen) to more budget-friendly luxury hotel rooms or Honeymoon casitas for two. On site amenities include three fresh-water pools (one has a waterslide), a hot tub, paddleboard and kayak rentals, and bicycle rentals. Additionally, the resort will be happy to arrange all your scuba diving, snorkeling and mainland tours. Dining options include the Coco Café for breakfast and snacks and the Cocoblanca Restaurant and Pool Bar. Located in a quiet and private little corner of paradise 6.5 miles from the bustle of San Pedro Town, the Costa Blu resort is an adults-only destination ideal for a romantic Caribbean escape. All 38 of the elegant one-bedroom suites offer king-size beds, newly refurbished bathrooms, kitchenettes, and balconies where you can enjoy wonderful views out over the ocean. 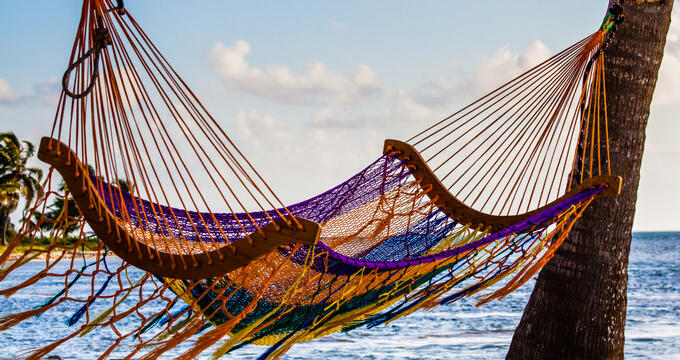 You can spend your days relaxing on a beach lounger or hammock or get more active and try your hand at paddle-boarding, kayaking, jet-skiing, kite surfing, or just having fun on a banana boat. Scuba and snorkeling expeditions can be arranged, and you can round off your busy day with a romantic private candle-lit dinner. The family-owned and run El Pescador fishing resort is the ultimate destination for anglers who dream of catching a big one in the tropical waters of Belize. You can choose to stay in one of the comfortable rooms in the main Lodge or treat yourself and your family to an elegant and well-appointed El Pescador Villa. Whichever option you choose you can look forward to stepping out directly only the expansive white coral beach where non-anglers can spend their days soaking up the sun and enjoying the complimentary bicycles, kayaks, and three swimming pools. The resort’s tour office will happily arrange all your mainland tours as well as fishing, scuba-diving, and snorkeling excursions. On-site fly-fishing lessons are available. Located in one of the most beautiful sea-front locations on the island, the Grand Colony Island Villas offer visitors a choice of up-scale self-catering villas that benefit from many amenities you would expect from a resort. You can choose from two- or three-bedroom villas, all of which overlook the sea or the pool area – you will never be more than a few steps from the beach. The resort offers guests several tours and activities, including the chance to dive or snorkel the beautiful Belize Barrier Reef, do some bird watching at an island sanctuary, try your hand at fly fishing, or head to the mainland to see the Mayan ruins and have a jungle adventure. Located right on the beach in the heart of San Pedro Town, Holiday Hotel has been welcoming discerning budget-conscious visitors for over 50 years. The hotel offers a variety of rooms suitable for couples or families, all boasting en-suite bathrooms, sea views, and cable TV. The hotel recently opened the Caprice Grill and bar where you can enjoy alfresco dining right on the beach. All the quaint shops and restaurants of San Pedro Town are within easy walking distance, and there is an all-day deli directly across the road where you can buy breakfast, lunch, and snacks. The hotel’s friendly front desk will be happy to arrange all your tours and excursions, including glass-bottom boat trips to the Hol Chan Marine Reserve and Shark Ray Alley. 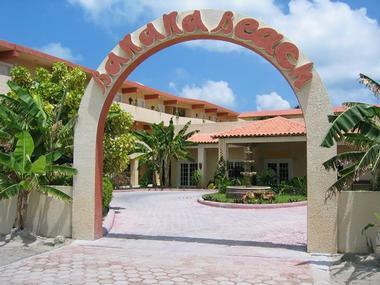 The beachfront Hotel Del Rio will transport you back to the earlier days in Belize, before a multitude of tourists discovered this delightful Caribbean gem. 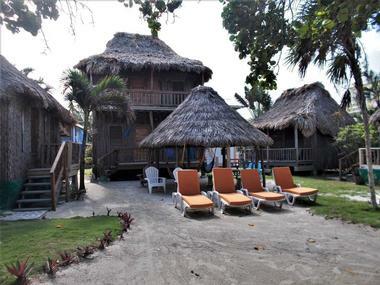 The hotel offers a variety of traditional rustic Belizean thatched beach cabanas, all of which have private bathrooms and high-speed internet access (some also have air conditioners and kitchenettes). You can step right on to the beach from your cabana, and a short walk will have you in the center of San Pedro Town where a variety of restaurants and shops are located. 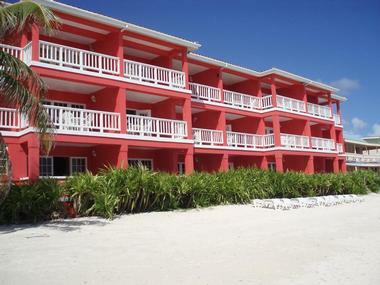 Hotel Del Rio will help you plan all your diving, snorkeling and adventure tours in and around Ambergris Caye. Las Terrazas Resort welcomes you to a haven of luxurious peace and tranquillity, set right on the edge of the azure Caribbean Sea and north of San Pedro Town. Each of the stunning residences offers visitors luxury furnishings and kitchens as well as beautiful views over the ocean or the tropical gardens. At Las Terrazas Resort you can look forward to being pampered at the Spa, relaxing on the beach or beside the infinity pool, enjoying cocktails at the rooftop Sky Lounge, or dining at the O restaurant. Water activities include the complimentary use of kayaks, Hobie Cats, paddleboards, and water bikes, and there are also bicycles available. Wave-runners, golf carts, and fishing gear are available to rent on site. Mata Rock Resort is an intimate boutique-style resort with just eleven rooms and six junior suites, all of which offer sea views. You can choose between a single queen-size bed or two singles. All the rooms have cable TV, wireless internet, daily service (including fresh bed linen every day), air conditioning, and a mini-kitchenette with coffee maker, bar-fridge, and microwave. You can step directly out of your room onto the beach and spend your days relaxing under the swaying palm trees. Mata Rocks has a beach bar where you can order cocktails, and the best thing about this resort is that you are less than a half-mile from the amazing marine wonderland of the Belize Barrier Reef. Vacationers looking for a resort that offers the perfect combination of Belizean charm and up-scale luxury need look no further than the delightful Matachica Resort and Spa. All the colorful thatched casitas, rooms, and villas offer views of the tropical gardens or the ocean and feature contemporary furnishings and décor. 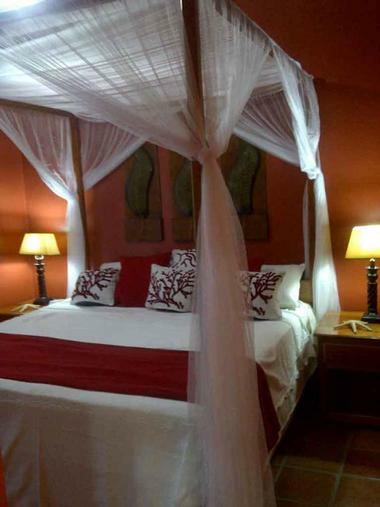 You can look forward to enjoying luxury bed linens, duvets and toiletries and all rates are inclusive of breakfast. 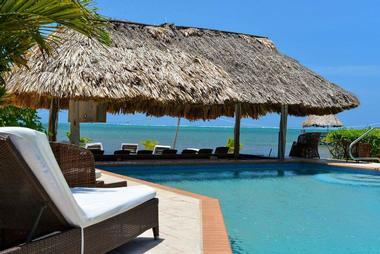 The on-site restaurant serves up fresh Belizean delicacies, and there is a spa for additional pampering. The resort offers kayaking and paddle-boarding, and the staff will be happy to arrange scuba and diving excursions to the Belize Barrier Reef and other top dive sites. 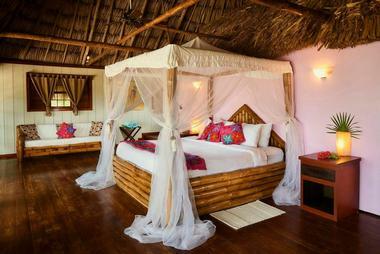 Matachica is an adult-only resort – the perfect spot for a romantic honeymoon. The Portofino Beach Resort is nestled at the edge of the ocean, surrounded by gently swaying palms. The authentic Belizean thatched cabanas and suites are beautifully furnished, featuring exotic wooden floors and large comfortable beds with luxury linens. Should you need a change from the beach you can enjoy the large outdoor pool or stop by the on-site spa waiting to pamper you. The resort has a dive shop that offers lessons and certification as well as snorkeling and manatee-watching tours. You can enjoy breakfast, lunch, and dinner at the Portofino Restaurant or the Green Parrot Beach Bar and Bistro. Fully inclusive packages are available. Tranquilly located ten miles north of bustling San Pedro Town, the Sapphire Beach Resort offers the perfect mix of serenity and adventure. You can relax in one of several beautifully furnished and equipped villas and suites overlooking the ocean or lush gardens and outdoor pools. If it is action you are after, you will not be disappointed – the resort offers a wide selection of tours and excursions to prime dive sites, snorkeling reefs, mainland Mayan ruins, and much more. Although all the villas feature full kitchens, you can enjoy all your meals at the Gem Restaurant or sip an indulgent cocktail at the Gem Tikki Pool Bar if you don’t wish to self-cater. Located within easy walking distance of all the quaint shops, galleries, and restaurants of San Pedro Town, the Seven Seas Resort offers comfortable, fully equipped one-bedroom suites where you can enjoy a relaxed Caribbean vacation just steps from the beach. 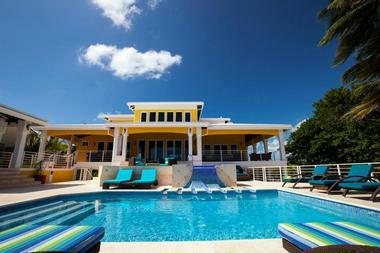 Each villa features air conditioning, fully equipped kitchens, queen-size beds, free Wi-Fi, and multi-channel TV. 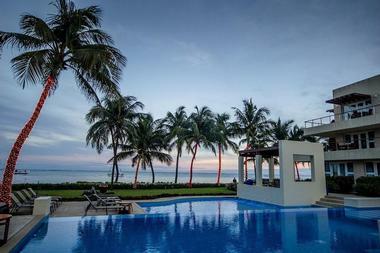 The resort has a secluded private pool as well as a roof-top sun deck and a lounging area overlooking the sea. You can spend your days enjoying a multitude of Caribbean adventures, including scuba diving and snorkeling excursions, fishing trips, mainland Mayan ruins tours and jungle adventures with zip-lining and cave tubing. 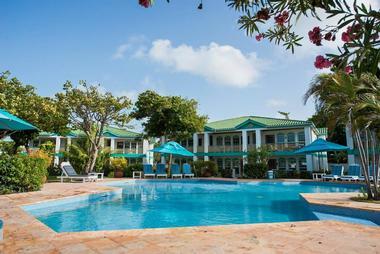 Located on the edge of the ocean a stone’s throw from quaint San Pedro Town, the Seabreeze Hotel is an ideal Belize destination for both couples and families. The hotel offers a variety of clean and comfortable rooms, all of which feature air conditioning, private modern bathrooms, small refrigerators, hair-dryers, and cable TV. Some of the rooms are inter-leading, making them ideal for families. On site amenities include a pool, outdoor lounge overlooking the courtyard, the ocean-front Blue Water Bar and Grill, a spa, and the Dive Center where you can learn how to scuba and snorkel and arrange all your excursions. The front desk will be delighted to book any other adventure tours you fancy. 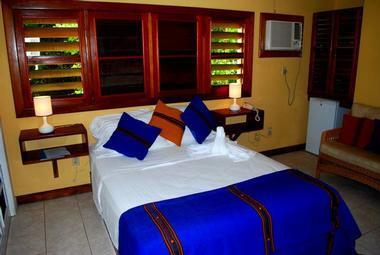 SunBreeze Suites offer a great alternative to a regular beach hotel. Each of the comfortable one-bedroom suites has a fully fitted kitchen, a separate lounge area (with double-size futon), and a private balcony where you can enjoy watching the Caribbean sunrise. 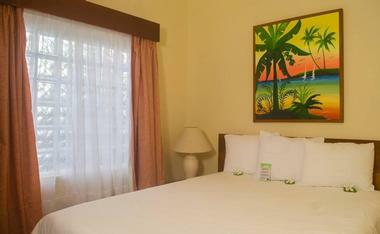 Bedrooms are fitted with either queen or king-size beds, and the suites are all air conditioned. Should you not wish to self-cater you can take all your meals at the open-air beachfront restaurant and bar. Soak up the sun around the pool or on the private dock, which is also the pick-up point for various scuba and snorkeling excursions. The enthusiastic staff is at your service to arrange fishing trips, picnics, and mainland adventures. 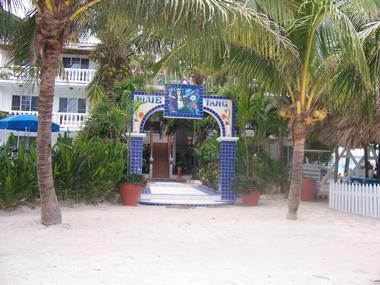 Nestled in the heart of quaint San Pedro Town, the Palms Oceanfront Suites offer a comfortable home-from-home base from which to explore all the delights of Ambergris Caye. Each of the individually decorated suites has a fully equipped kitchen, spacious living room, private balcony overlooking the Caribbean Sea, and either one or two bedrooms. You can spend your days relaxing on the beach or beside the pool or get the resort to line up a list of Belizean adventures to keep you occupied from dawn to dusk. You can learn to scuba dive or snorkel – excursions can be arranged to some of the best dive sites in the area, and there are many mainland tours on offer, including visits to ancient Mayan ruins and great jungle adventures. 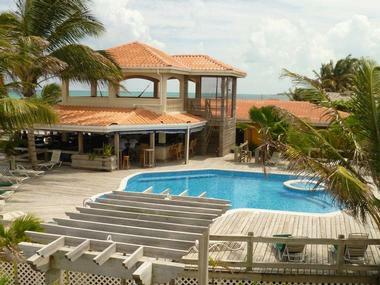 The Victoria House Resort and Spa offers a range of luxurious accommodation options right on the edge of the azure Caribbean Sea. Whether you choose to spend your vacation in one of the luxury villas (some even have private infinity pools), a traditional thatched casita, or one of the resort’s comfortable staterooms, you can be assured of a totally luxurious experience. Look forward to all the little extras that make a vacation special such as down duvets and pillow, bathrobes, luxury toiletries, and complimentary continental breakfast. You will have access to the on-site spa for pampering, and the resort offers complimentary use of kayaks and bicycles. Needless to say, scuba, snorkeling, fishing, and other activities can all be arranged onsite. Located just a few minutes south of San Pedro Town, the superb Wataview vacation home offers the ideal solution for larger groups wanting to enjoy a resort-like experience in the privacy of a private home. The spacious house has no less than five superbly furnished and decorated bedroom suites, each of which boasts a private sea-view balcony and luxury appointments. There are extensive living and dining areas, a fully equipped kitchen, large outdoor pool and hot tub, gym, tennis court, and private jetty. The sensational home is fully staffed so that you do not need to lift a finger – housekeeping, laundry and meals are all taken care of. There are tennis rackets, kayaks, and paddleboards as well as fishing equipment available to guests.